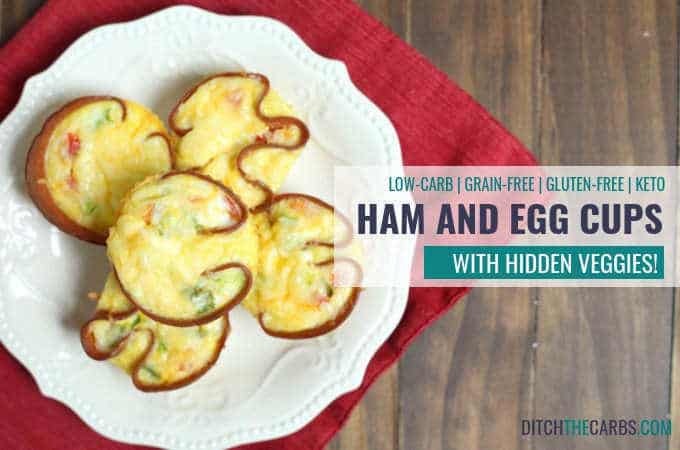 Low-carb ham and egg cups are such a simple idea using a piece of ham instead of pastry. It makes them naturally gluten-free, grain-free and wheat-free. They are incredibly low in carbs so makes a wonderful high protein, low carb snack and lunch box filler. You can also make a few batches for a perfect addition to a brunch table. YUM! As you know, I love adding more veggies wherever I can and these are no exception. For flavour, I add sliced spring onions and diced bacon to the bottom, diced vegetables into small pieces and pour the egg mixture on top. Alternatively, just crack a whole egg into the ham lined cupcake case. Sprinkle with grated cheese or top with a cherry tomato. 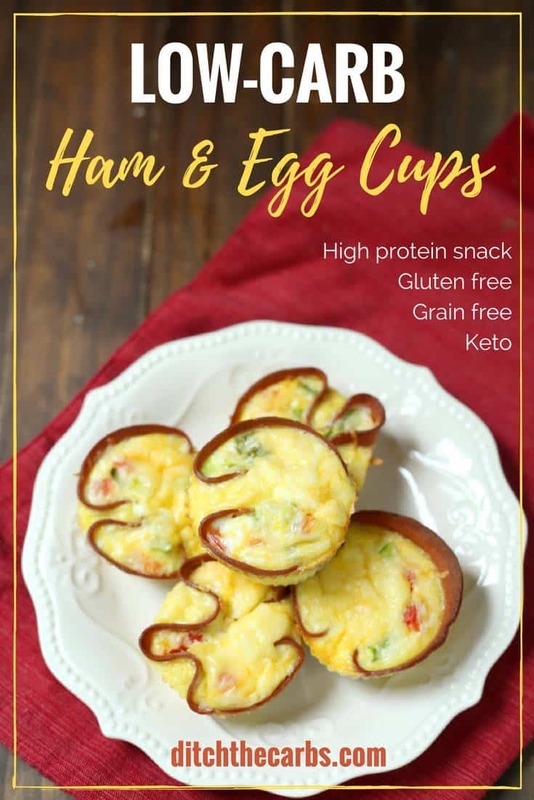 The possibilities of these low-carb ham and egg cups are endless. I have got into the routine of making a dozen on a Sunday night for the next week’s lunch boxes and freezer. Ham and egg cups take no time at all to prepare. Add anything you like into ham and egg cups. What about sneaking some extra veggies in there? Extra cheese? Line a cupcake or muffin tray with a slice of ham. 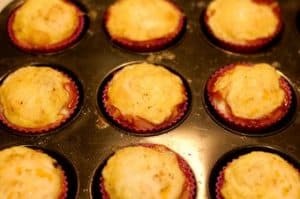 I use silicon cupcake cases but you can use a regular oiled muffin tray. Place 2 slices of spring onion, a few bacon pieces and whatever vegetables you choose in the bottom of the ham. In a pouring jug, whisk together the eggs and milk/cream with a fork. Pour evenly between the ham lined cupcake/muffin tray. Bake at 180C/350F for 15 minutes or until cooked through. Eggs related recipes are wonderful to me. I love your recipe and I really want to add this to my breakfast plan immediately. Hi there, just made these and I wonder where I went wrong. They tasted good, and I made them exactly as suggested, however the paper up stuck to the egg, wasted half the egg mixture and it also leaked all over the pan, as though they were trying to be a soufflé! I appreciate the website and all your recipes, I just wish I had had better luck! The muffin tin took forever to clean, so I’d like to ensure I don’t make the same mistake twice. just wondering what ham you use? I either use ham off the bone (sometimes a bit too thick so I use it as a ‘base’) or thinly sliced ham (slightly more processed but I choose one with minimal ingredients). Otherwise thin deli sliced roast beef works well too. I am in awe of how i’m not yet already subscribed to your blog! These look delicious! You don’t cook the bacon prior do you? I saw you said you don’t in the crustless bacon and egg pies and wondered if it was true for this recipe as well. Thanks! Hiya, This is probably a silly question to ask, but do you precook the added veggies before adding to the mixture please ? Cheers . Excellent website !!! 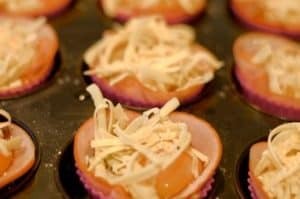 I tend to add leftover cooked vegetables from the night before, or if they aren’t pre cooked like this, I will cut them up so they are small and will cook in the time it takes for the ham and egg cups to cook. Some vegetables don’t need pre cooking such as cherry tomatoes, spinach, mushrooms etc. I serve them cold. I just pop them in their lunch boxes and I don’t even use freezer blocks for any of my children and never had a problem. Ask them what they would like in their own ham and egg cups and they seem to be more open to trying new ideas. These look great! Would you freeze before or after you’ve cooked them? Definitely after cooking. Place sheets of baking/parchment paper in between so you can pull 1 or 2 out at a time. I only use whole eggs and they stay fresh in the fridge for 3-4 days. You can freeze them too and be super organised for the week ahead. Hi Libby ! Thanks so much for sharing this cute recipe ! Love ‘hiding’ the veggies – the old ‘tuck the broccoli under something else on the plate’ technique , only much tastier ! Great looking egg cup! Brilliant!